In the middle of America’s most urban metropolitan area, the world’s largest vertical farm is about to deliver its first harvest of sweet, leafy baby greens. 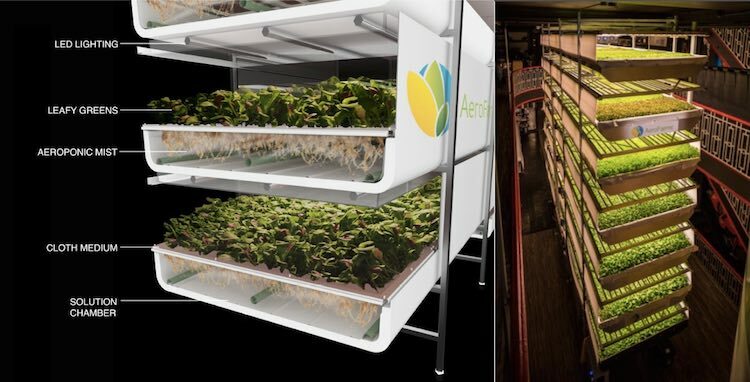 AeroFarm is using “aeroponic” farming to grow massive amounts of food, but instead of taking of acres of land and tons of water, it is all done in a confined space. Crops grow in shelf-like bins that rely on special LED lights instead of sunshine. Instead of soil, the plants grow in a reusable fabric made from recycled plastic bottles that can be easily cleaned and sanitized between crops– eliminating the need for pesticides, fungicides, and herbicides. The vertical farm can grow 70 times more food per square foot than farmers can raise in an open field. Because the facility recirculates water, it uses only 5% as much water and half as much fertilizer, which often pollutes nearby streams. AeroFarms achieves its high production by staggering crops throughout the year. The company is able to switch between 22 different crops featuring roughly 250 varieties of fruit and vegetables. The crops will be marketed to people in New York City, less than an hour away, to cut down on both the cost and pollution of transportation. The first “planting” at the Newark facility took place in March and the first harvest will feature leafy summer greens. 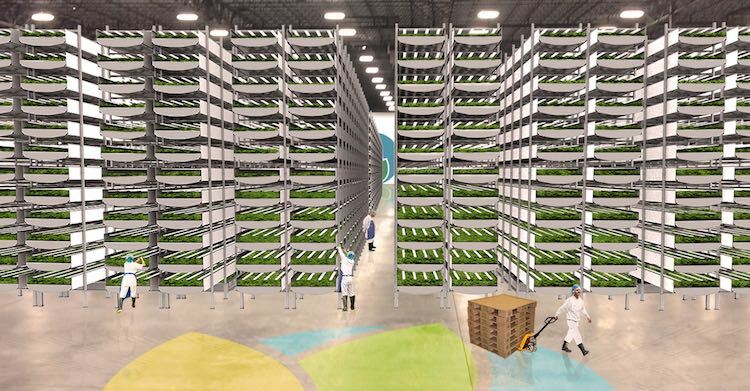 The Newark facility is one of four vertical farms the company is operating, with more projects underway across the U.S. and abroad.